lives in California with her husband and two daughters. It was her oldest daughter’s love of books that first inspired her to write for young adults. There is never a time that she can be found without a book in her hand, and she adores stories that take her to new places, and then take her by surprise. Growing up all over the country has inspired wanderlust and she loves travel, which works out well because she lectures internationally on a variety of health care topics. She has a Doctorate in Physical Therapy and maintains a full-time practice. Learn more at Lisa Desrochers’ blog. CLICK HERE FOR MORE TITLES BY LISA DESROCHERS. Personal Demons — (2010-2012) Young adult. Publisher: If you had to choose between Heaven and Hell, which would it be? Are you sure about that…? Frannie Cavanaugh is a good Catholic girl with a wicked streak. She’s spent years keeping everyone at a distance — even her closest friends — and it seems her senior year will be more of the same… until Luc Cain enrolls in her class. No one knows where he came from, but Frannie can’t seem to stay away from him. 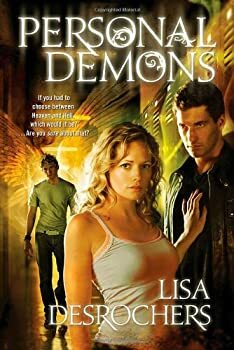 What she doesn’t know is that Luc works in Acquisitions — for Hell — and she possesses a unique skill set that has the king of Hell tingling with anticipation. All Luc has to do is get her to sin, and he’s as tempting as they come. Frannie doesn’t stand a chance. Unfortunately for Luc, Heaven has other plans, and the angel, Gabe, is going to do whatever it takes to make sure that Luc doesn’t get what he came for. And it isn’t long before they find themselves fighting for more than just her soul. But if Luc fails, there will be Hell to pay… for all of them. At first, Personal Demons reminded of those Christian romances I devoured like potato chips when I was in high school — the ones where a hot date meant getting together to read the Bible. Frannie, the high school girl who is the principal viewpoint character, comes from a large Catholic family and seems, initially, to be intent on remaining true to every bit of her Catholicism. In my own large Catholic family, that would most definitely include allowing no boy to touch me between my neck and my knees before my wedding night. So I settled in for what I thought would be a conservative young adult novel that would make its points about morality by having the persuasive swain be, literally, a devil.